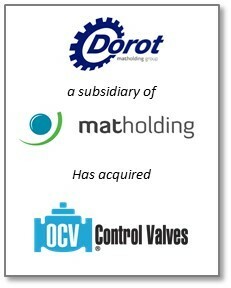 InterOcean Advisors LLC is pleased to announce the successful acquisition of OCV Control Valves, LLC, AMS Machining Specialists, LLC, and Precision Coatings, LLC (collectively known as “OCV” or “OCV Control Valves”) by OCV Fluid Solutions LLC, a US subsidiary of Israel-based Dorot Control Valves and, ultimately, Spanish company MAT Investment Holding, S.L. (“MAT Holding”), a multinational industrial group devoted to investments in crop protection, irrigation efficiency and water treatment and handling. InterOcean worked alongside fellow Terra Alliance member Sabadell Corporate Finance as the exclusive financial advisors to MAT Holding. Founded more than 50 years ago in Tulsa, Oklahoma, OCV is a market leader in designing and producing hydraulically-operated, diaphragm-actuated, automatic control valves for sale in North America, Europe and Asia. OCV’s high quality control valves are used in a range of precision fluid handling and control system applications, including aviation fueling, waterworks, fire protection, mining, commercial plumbing and energy-related terminal services. MAT Holding is a multinational industrial group with more than 80 years of history investing in leading companies in the areas of crop protection, irrigation efficiency and water treatment and handling. The group develops solutions that contribute to the production of healthy, safe and affordable food products, as well as to the sustainable use of water in agricultural and industrial activities. MAT Holding, through its subsidiaries, operates in more than 100 countries and is the world’s leading producer of copper salts for agriculture and valves for water control and is the market leader in the Spanish and Portuguese drip irrigation markets. Located in Tulsa, Oklahoma, OCV Control Valves is a market leader in designing and producing hydraulically-operated, diaphragm-actuated, automatic control valves. With 50,000 sq. ft. of integrated manufacturing space, OCV offers in-house machining and coating services which enable the company to produce high-quality valve products for sale in North America, Asia and Europe. Sabadell Corporate Finance is the mergers and acquisitions advisory unit of the Banco Sabadell Group, Spain’s fourth largest private banking group.